Posts on our bed and breakfast accommodation blog about County Durham in North East England, DH1, DH2, DH3, DH4, DH5, DH6, DH7, DH8, DH9, DH97, DH98 and DH99. If you are visiting Beamish Museum this winter then you may like to take a spin on their ice rink – open daily from today 18th November 2017 until 7th January 2018 – closed Christmas Day and Boxing Day. Weekends only from 8th January 2018 until 9th February, daily from 10th February until 18th February (half term) and weekends only from 19th February until 25th February 2018. 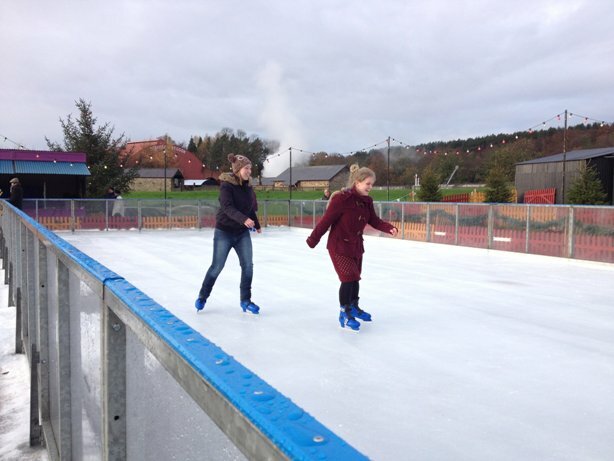 Beamish Museum‘s real ice rink is twenty metres by ten metres and can accommodate up to seventy skaters and promises to be a festive experience for all the family, suitable for novice skaters up to expert. Beamish Museum‘s ice rink is part of their winter fun fair and is decorated in a traditional Edwardian style with festoon lighting. Ice skating tickets are available to purchase at the winter fun fair. Tickets include skate hire and cost £5 for adults and £4 for children up to 16 years old. Under 7’s must be accompanied on the ice by an adult. Children aged 8 to 12 must be supervised by an adult (from rink side). Skate sessions last a minimum of twenty minutes. There is also a special offer – for every full paying adult, one child skates free. Skate session times are listed below and include initial skate collection/exchange, at least twenty minutes on the ice and skate return/exchange. Skates are available in junior size 8 to adult size 15. Our bed and breakfast accommodation welcomes 100’s of guests each year who stay with us when visiting Beamish Museum – their 2017-2018 flyer can be seen below. If you are looking for bed and breakfast accommodation for your visit to Beamish Museum our bed and breakfast availability is here: online booking. Durham Lumiere is back for 2017. The UK’s largest light festival is back in Durham for the fifth time between Thursday 16th and Sunday 19th November 2017. The festival is open from 4:30pm until 11pm every evening. A free ticketing system will be in operation during peak times between 4:30pm and 7:30pm for the city centre peninsula area. More than 200,000 people visited Durham Lumiere in 2015 so expect Durham city centre to be very busy. Durham Cathedral, Durham Castle and historic Miner’s Hall at Redhills are three venues that will host some of the twenty eight light installations over the four day festival. If you are looking for bed and breakfast accommodation for your visit to Durham our bed and breakfast availability is here: online booking. Our bed and breakfast accommodation welcomes 100’s of guests each year who stay with us when visiting Beamish Museum – their summer season starts tomorrow (6th April 2017). 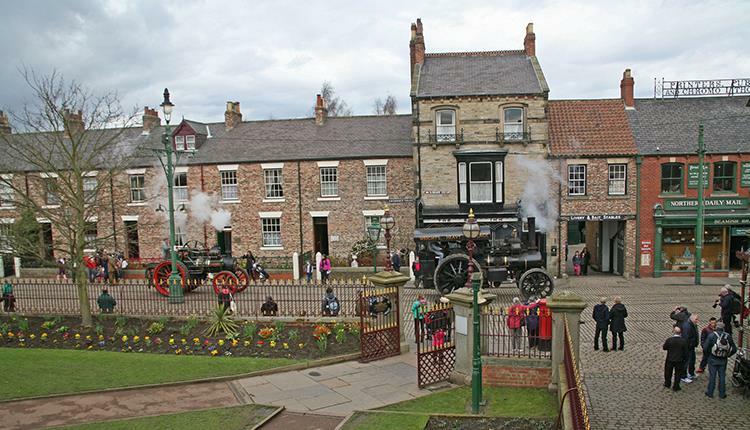 From tomorrow Beamish Museum is open daily from 10am until 5pm. Below you can find the latest 2017 Beamish Museum flyer here which contains season dates, opening times and their 2017 admission prices. Next month sees the return of the popular Great North Steam Fair at Beamish Museum, Beamish, County Durham, DH9 0RG. As part of their Great North Festival of Transport Beamish Museum hosts an annual (and famous) steam fair – The Great North Steam Fair featuring an amazing line-up of visiting vehicles and Beamish transport in action and on view – from motorcycles to steam lorries – and everything in between. The extraordinary line-up will include steam locomotives, up to 80 motor vehicles such as motor cycles, cars and lorries and around 20 road steam vehicles. The Great North Steam Fair takes place from Thursday 6th April until Sunday 9th April 2017 from 10am until 5pm each day.